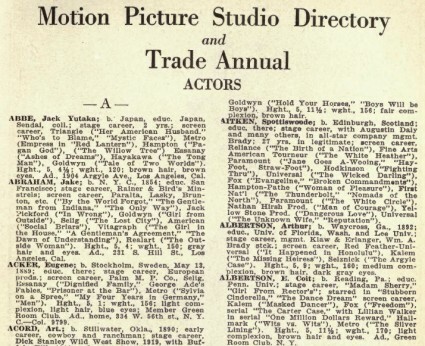 Two directories to the actors, directors, producers, and technicians of the motion picture industry for the years 1919 and 1921 are contained in this database. 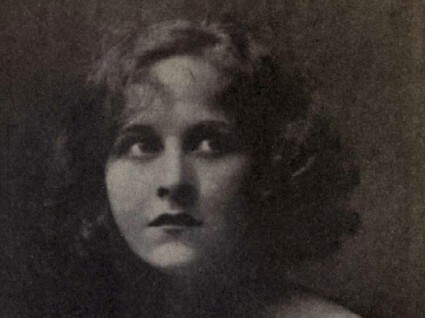 Each directory has a biographical section with information about the listed individuals such as their name, birth date and place, a brief career bio sometimes including educational history, a physical description (for the actors) or special skills description (for production crew), and membership in clubs, unions, or other organizations. Many entries include addresses and some photographic portraits are featured. All are listed in an index at the back of each directory. Section divisions for the directories are as follows: actors, actresses, child parts, directors, assistant directors, scenario editors and writers, cinematographers, studio managers, publicity men, laboratory and property men, and film cutters. The actors’ and actress’ sections are further sub-divided into leads, ingénues, characters, comedians, and heavies (villains). Biographical entries, besides the above listed information, also note films the individual has worked on and other important or relevant experience such as the bio of cinematographer Herbert Oswald Carleton which specifically mentions his early career as a mechanic and inventor as well as his patented invention, the Duplex Printing Machine. Each person entry on the Ancestry database comprises: Surname, Birth date and place, Career summary, Description of physical appearance (actors) or other skills (technicians and crew), and Membership in clubs or societies. This is very handy for those searching for names across Ancestry’s gigantic database of genealogical information who require all such information to be in one place. However, it should be noted that the Motion Picture Studio Directory and Trade Annual for 1921 is freely availably online in word-searchable form from the Internet Archive, which also makes available Charles Donald Fox and Milton Silver’s Who’s Who on the Screen (1920) which the Bioscope has introduced before now and portraits with text from which are reproduced on the Bioscope’s Flickr site. So it’s always worth checking twice with these things, and you can find summaries of Who’s Who on the Screen and now the Motion Picture Studio Directory and Trade Annual for 1921 in the ever-growing Bioscope Library.